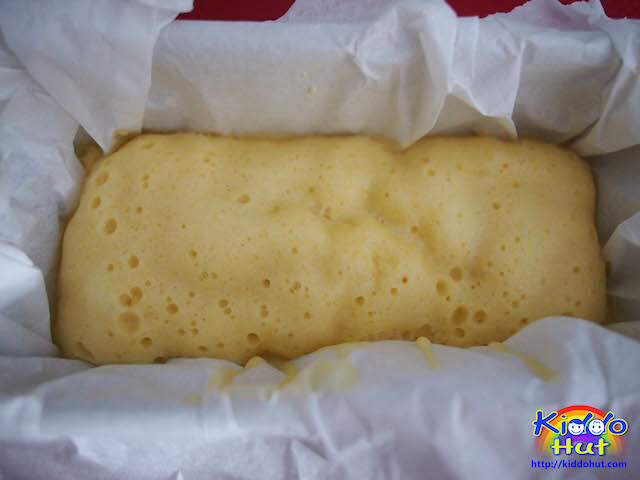 Steamed egg cake a.k.a steamed egg sponge cake a.k.a Ji Dan Gao is a rather easy steamed cake to make as the main ingredients are flour, sugar and egg. The olden days’ recipe is always known to be 1 cup flour, 1 cup sugar and 1 cup egg. My mum always shares with me how scary this cake was to her and her siblings, reason being they were asked by my grandmother to beat the eggs until light and fluffy using hands whenever she wanted to make the cake for the family. Unless I wish to train my hand muscles which obviously I have no such intention, I am very grateful to my Kitchenaids mixer. The whole motivation of making this cake was because I just bought an organic cake flour that is without bleaching and can’t wait to steam cake using it (until I get an oven, my cake will be mainly steamed). And, I wanted to try out the Soda Stream gifted by my sister. I searched through the world wide web and found many recipes online. In fact, the amount of eggs used varies which definitely affects the texture. How to ascertain if the cake is successfully made, it must taste spongy and there shouldn’t be a thick layer at the bottom of the cake. I have tried several times to get the right texture by varying the amount of eggs as well as the size of eggs. Apparently, size of egg matters! I have tried increasing the number of eggs to 4, the cake was dense. I have also used the large egg (60g each), the cake was dense too. So, to get the soft and spongy texture, do follow the recipe strictly. To ensure you do not get the thick layer at the bottom, do beat your eggs till light and fluffy. Many people is worried over over-beating the eggs, frankly I have not experienced over-beating of eggs. With egg yolk, it is rather difficult to over-beat. Notwithstanding, there is no need to over-beat the eggs. Stop at ribbon stage or when the egg foam can stay in its shape for 5 seconds and more (I am more kiasu, usually it should be 3 seconds but I waited for 5 seconds). Another learning experience is, you should open the can of soda water only when you need to pour it into the batter. Else, some of the gas will be lost through waiting. I am fortunate to have the Soda Stream which I can add on more gases when I need it. If you wish to have other taste like ice cream soda or marinda mandarin, go ahead and replace the soda water with other gassy drinks. I have not came across anyone using Coke though. 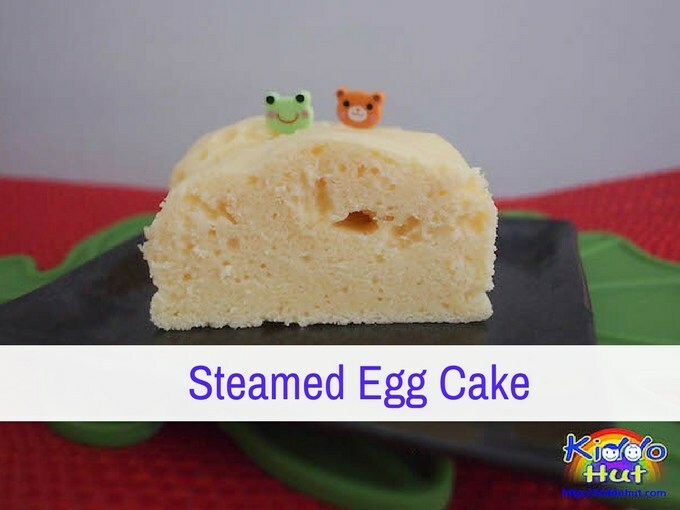 Try this steamed cake recipe which is rather easy and quick, and delicious too! 1. Whisk eggs and sugar using electric mixer for 5 minutes under medium speed until bright yellow then continue to whisk on high speed for another 10 minutes or until ribbon stage. 3. 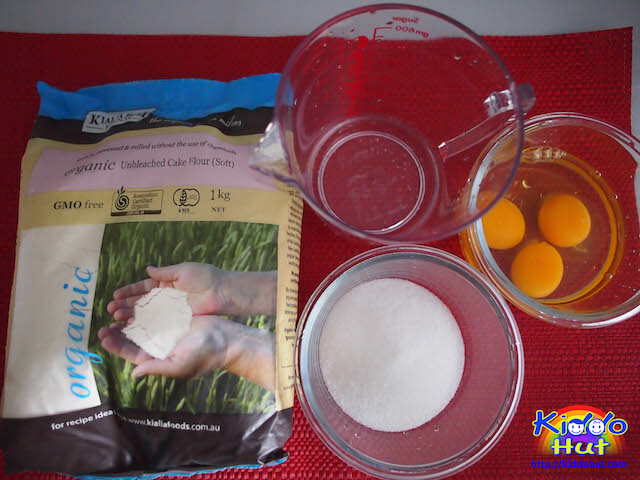 Quickly fold in the 1/4 portion of the sifted cake flour, followed by 1/3 portion of soda water and oil, then fold in another portion of the sifted cake flour. Continue this process until all flour and soda water mixture are folded in. This process should be done as quickly and gently as possible. After folding in everything, you will see some bubbles forming. 4. Pour the batter into the aluminium tin and steam for 25-30 minutes. Test with toothpick, if the toothpick comes out clean, it is cooked. 5. Open the steamer cover and let it cool. Serve. You can replace the soda water with other gassy drink like 7-up, cream soda, sprite, orange. I have added orange syrup to the soda water to give me the orange-flavoured steamed egg cake. Am new to making cakes. What do u mean by “fold in the flour”? Thanks for visiting my blog. Folding in the flour simply means gently and gradually adding in the flour, a little at a time, using a spatula to do horizontal sweeping motions, to ensure the flour is well-mixed or combined into the wet ingredients. 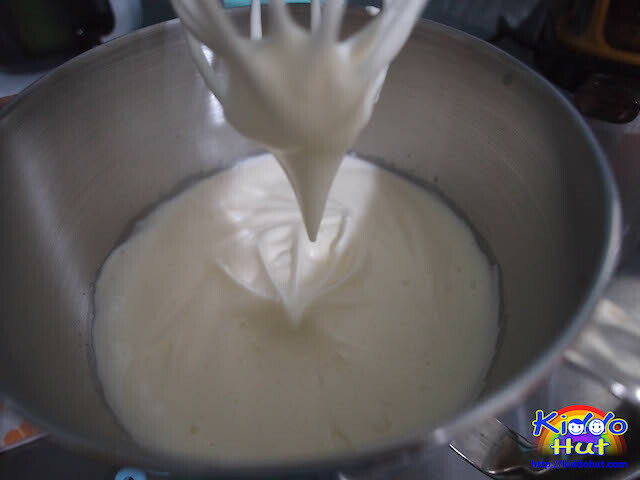 Normally, you do not pour all the flour at one go into the wet ingredients as the flour won’t be well “combined” and caused lumpiness, after steaming, you will still see lumps of white flour in the cake.